Oscars: Judy Garland’s Kids to Reunite for ‘Wizard of Oz’ Tribute Judy Garland‘s three children — Liza Minnelli, Lorna Luft and Joey Luft — will reunite at the 86th Academy Awards on Sunday night to help commemorate the 75th anniversary of their late mother’s most iconic film, The Wizard of Oz, The Hollywood Reporter has learned from multiple sources. Garland’s three children haven’t always gotten along, but they are said to be on good terms these days and enthusiastic about this opportunity to celebrate their beloved mother in such a high-profile way. THR is told that specifics of what the commemoration will entail have not yet been locked down. The Magic of Oz: A Collection Celebrating a Classic “The Magic of Oz: A Collection Celebrating a Classic,” a special exhibition displaying rare books and artifacts pertaining to the “Wizard of Oz” series and its creator and prolific author L. Frank Baum, is on display at the Kenneth Spencer Research Library at the University of Kansas in Lawrence. The exhibition features early editions and more-recent foreign-language translations of “The Wonderful Wizard of Oz,” examples of other works by Baum and Oz illustrator W.W. Denslow, ephemera from the 1903 Broadway musical adaptation and a response to fan mail written by Baum’s wife. “The Magic of Oz: A Collection Celebrating a Classic” will be on display through April 19. KU Libraries also will host a gallery talk featuring Jane Albright at 5:30 p.m. April 17 at Spencer Research Library. The event is free and open to the public. Latest Vocaloid Musical “Music Wizard of OZ” Popular female vocaloid song creator OSTER Project will release her latest album “Attractive Museum” from a newly-launched label Subcul-rise Record on April 23. The 14-song album includes a new 20-minute long vocaloid musical tune “Music Wizard of OZ” featuring Hatsune Miku (Append), Kagamine Rin & Len (Append), Megurine Luka, MEIKO, KAITO V3, and Vocaloid3 Megpoid. As the title suggests, the musical is based on the 1939 fantasy film The Wizard of Oz. The illustrations in the PV are drawn by Y-oji, who has worked with OSTER Project for several years including the famous “Alice in Musicland” PV. Farmville Emerald Valley Munchkin Country #Zynga #Farmville’s Wizard of Oz themed expansion Emerald Valley will be revisiting a newer concept from a recent farm. The Munchkin Country feature will harken back to the Hollybright Tree from the Holiday Lights feature. Your #TheDirtFarmer team has a preview for you of what to expect on your Journey to Munchkin Country. The Truth About Shirley Temple’s “Wizard of Oz” Connection Among Shirley’s oft-cited literary favorites was the Wizard of Oz book series by L. Frank Baum and his posthumous successor, Ruth Plumly Thompson. In pictorial layouts of the Temple home, the Oz books were clearly visible on her bedroom shelf, and references were made to her interest in the adventures of Dorothy and her friends. In Child Star, her 1988 autobiography, Temple Black herself claimed that when her mother suggested she could play Dorothy in the movies, Shirley replied that she wanted to meet Dorothy, so absorbed was she in the Oz stories. ‘Wizard of Oz’ Ruby Slippers to Display at Costume Designers Guild Awards Tap your heels three times because the Costume Designers Guild Awards will be displaying a replica of the The Wizard of Oz’s ruby slippers at the entrance to the ballroom of the Feb. 22 ceremony, in honor of the film’s 75th anniversary. The iconic heels — covered in about 2,300 sequins with hand-sequined georgette and lined with leather — were originally designed by MGM’s legendary designer Adrian Adolph Greenberg. Western Costume’s Joe Napoli had originally made four pairs, with one currently housed at the Smithsonian. 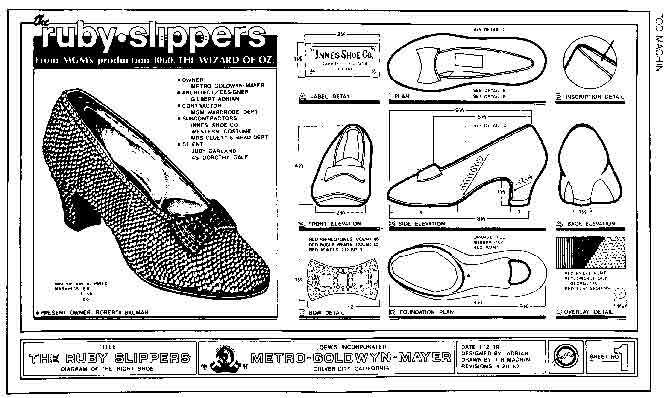 Judy Garland, who played Dorothy, wore the original pair. Weinstein Confirms ‘A Friend of Dorothy’ in Anne Hathaway! If the creative team sticks to the facts and let the comedy and tragedy of Judy’s life play out as it happened sans gross embellishment and with Hathaway’s incredible talent then the film could be pretty spectacular. For my money all concerned screenplay, direction and leading lady must all combine to present in an understated way Garland’s larger than larger life. If we are going to see a film depicting the woman fumbling for a bottle of pills of every two minutes: A GREAT BIG YAWN. In the end I am reminded of a scene between Harper Lee and Truman Capote in the film INFAMOUS. Sensing that Mr. Capote is attempting to “color” the facts of the Clutter Family for his new found reportage, “In Cold Blood”, Miss Lee looks him dead in the eye and says “the truth is enough!”. Tell the truth . Tell it with class and an even hand. In the end hopefully Anne Hathaway, Harvey Weinstein and company will all produce a film that proves that they are all “Friends of Dorothy”.